My Nonna is rolling in her grave right now. This pasta used to have hot dogs in it. I ate them all out of shame. I can make a decent authentic Italian sauce. (Note: If someone tells you pasta sauce is called gravy, just kick them in the crotch and walk away.) My mom taught me Nonna’s recipe, painstakingly walking me through each step, each adjustment for consistency and flavor. For a while (pre-child), I would spend my Sundays standing over a large pot of simmering saucy goodness that I would then serve to a table of Mexicans who proceeded to defecate on the meal by pouring Tapatio all over it. One day, after I spent a couple hours rolling meatballs and stirring the sauce with a well-seasoned wooden spoon, my husband made a stunning confession. Alex: I actually like Prego sauce better than your Nonna’s sauce. Alex: What? I just do! It’s better. It’s got more…I don’t know…flavor? Alex: Why are you looking at me like that? Me (strongly considering divorce): I…just…can’t talk to you right now. Not cool, Alex. Not cool. 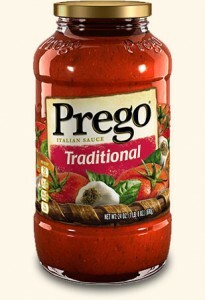 Being told that Prego is preferred over the real-deal sauce, the sauce that I love, the sauce that I planned to pass down to my kids, was pretty much a kick in the crotch. (I’m stuck on this crotch metaphor today, just roll with it.) I vowed to keep making it anyway, but the wind had been knocked out of my sails, and after Lucas was born, I just couldn’t justify spending a couple hours on a meal that I knew my husband wasn’t really enjoying. I still bust it out for company (who all, by the way, seem to LOVE IT), but it’s not the same. So I downshifted and found this bottled sauce I could live with: Gina Rispoli, which is made in Hoboken, New Jersey, which we all know is Italy, Jr. So fine, I cooked pasta with bottled sauce, but at least I still made the meatballs! For a while…But all of a sudden, I started needing weekday meals that could be turned around in a matter of 20 minutes (full-time job with long commute equals very hungry toddler by the time we get home), and homemade meatballs took too much time. 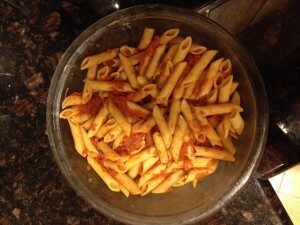 And plain pasta with plain sauce was a little…plain. We like our meat in the Zamora household. Guys, I put the hot dogs in the bottled sauce and served it as a meal. I’m ashamed to call myself Italian right now. I’m sorry, Nonna. I’m really sorry. I think I need to appease the Italian gods (in the name of the godfather, the pushy mother, and the holy garlic) and cook up an authentic Italian storm this weekend. Even if I’ve got five loads of laundry and a restless child running circles around my legs, I don’t care. The meatballs will be made, dammit! The sauce will be stirred! And may Nonna have mercy on my soul! Why Do We Even Have Those Seven Fishes? He is, Mike. He really is :). Glad you guys got a kick out of it! And yes, my mom has suggested freezing as well. She’s completely appalled that I put hot dogs in the sauce. Appalled. Too funny Wendy. 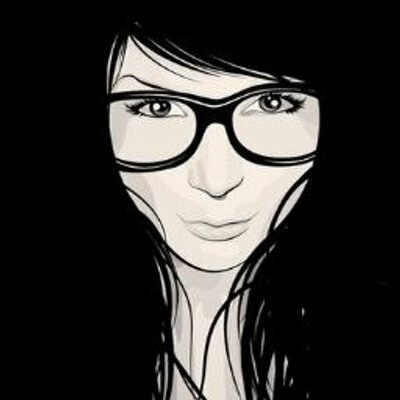 I too, in a many weak moments have resorted to Prego, it’s really pretty good. But I do doctor it up with extra garlic and olive oil and wine and maybe some sausage…OK, well, that’s probably more than doctoring it up isn’t it? But I feel to guilty just enjoying the convenience. 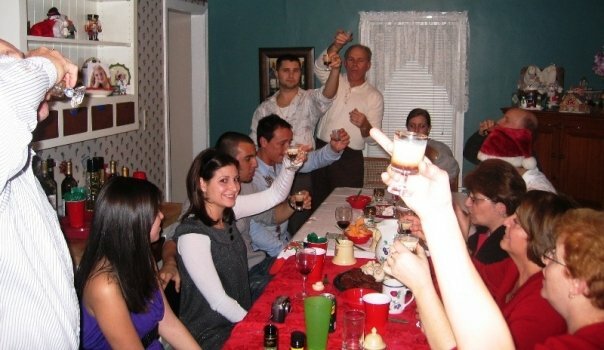 It’s not easy being Italian.